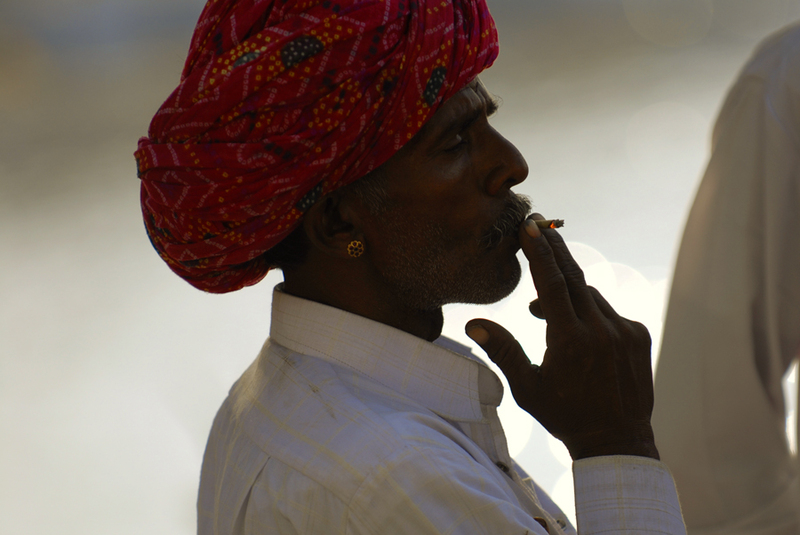 In this eleventh archive story by Kristian Bertel, we meet a smoking man in the town of Pushkar in Rajasthan, India. Many places in Rajasthan today have a feeling of its historic past. Historically, and centred in Rajasthan, the Rajputs were once a proud warrior caste with a passionate belief in the dictates of chivalry, both in battle and in state affairs. In this photograph a proud Rajasthani is pictured in the pilgrimage town of Pushkar, a town which is located in Rajasthan, India. In a silent moment on a late afternoon this Rajasthani man lits up a cigarette near the Pushkar Lake in Pushkar, India. Many of the people in this pilgrimage town are camel herders and many places in Rajasthan camel safaris are a popular tourist activity and can last from an hour to several days. The beautiful desert area around the town of Pushkar is inhabited by nomadic tribes and a camel safari can also be a cultural and photographic experience to remember. Pushkar has a magnetism all of its own and it is quite unlike anywhere else in Rajasthan. It is a prominent Hindu pilgrimage town and devout Hindus should visit at least once in their lifetime. The town curls around a holy lake, said to have appeared when Brahma dropped a lotus flower. It also has one of the world's few Brahma temples. With 52 bathing ghats and 400 milky-blue temples, the town often hums with pujas, which are prayers, generating an episodic soundtrack of chanting, drums and gongs, and devotional songs. The result is a muddle of religious and tourist scenes. The main street is one long bazaar, selling anything to tickle a traveler's fancy, from hippy-chic tie-dye to didgeridoos. Despite the commercialism and banana pancakes, the town remains enchantingly small and authentically mystic. Pushkar is only eleven kilometers from Ajmer but separated from it by Nag Pahar, also known as the Snake Mountain. As a traveling photographer in India and in Rajasthan in particular, Pushkar is one of a kind with its relaxing atmosphere. Pushkar is a holy town in the state of Rajasthan famous for the Pushkar Lake, various ghats and temples spread all around the lake. The word 'Pushkar' actually means lotus flower, which is said to be the seat of Brahma, one of the Hindu holy trinity, who is worshipped as the creator of this world. The legend has it that the demon Vajra Nabha killed Brahma's children, he in turn struck him with his weapon, a lotus flower. Vajra Nabha died with the impact, and the petals of the lotus fell at three places. One of them is Pushkar, where it gave birth to a lake. Brahma is supposed to have performed sacrifice at this lake on Kartik Purnima, the full moon day of the Kartik month, generally in the month of November, hallowing the place. Though Brahma is considered to be the creator of the world, Pushkar is the only temple of this important deity in the whole world. This is also considered as Adi Teerth or Teertharaj meaning ancient holy place or the most important of holy places respectively. There are not many temples built for Brahma because his influence to the daily life is considered not a big as Vishnu, who is the symbol of the preserver, Shiva, the symbol as the destroyer and Ganesh, who is the remover of obstacles. Being the creator, whatever being created is already there, whereas other deities' need to be appeased so that any wishes or favours can be granted or fulfilled. When the photographer visited Pushkar he also photographed the Pushkar Lake. A lake that is a beautiful, sanctified spot in the center of Pushkar. It is said to have been created by Lord Brahma and is therefore a place of pilgrimage for the Hindus. The lake is surrounded by 52 different ghats, or series of steps, which Hindus use to descend to the lake for ritual bathing, especially in the month of karthik. India is a land full of stories. On every street, on every corner and in the many places in India, life is rushing by you as a photographer with millions of stories to be told. In the archive story above, you hopefully had a readable insight in the story that was behind the photo of a smoking man in Pushkar. On this website of Kristian Bertel | Photography you can find numerous travel pictures from the photographer. Stories and moments that tell the travel stories of how the photographer captured the specific scene that you see in the picture. The photographer's images have a story behind them, images that all are taken from around India throughout his photo journeys. The archive stories delve into Kristian's personal archive to reveal never-before-seen, including portraits and landscapes beautifully produced snapshots from various travel assignments. The archive is so-far organized into photo stories, this one included, each brought to life by narrative text and full-color photos. Together, these fascinating stories tell a story about the life in India. India, the motherland to many people around the world, a land of unforgetable travel moments. The archive takes viewers on a spectacular visual journey through some of the most stunning photographs to be found in the photographer's archive collection. The photographer culled the images to reflect the many variations on the universal theme of beauty and everyday life in India. By adding these back stories the photographer's work might immensely enhanced the understanding of the photographs.